We took the girls to a birthday party last night at a suburban mall. Violet’s friend from preschool, in addition to having twin six-month-old sisters, had her aunt and cousin visiting from Belgium. It was her cousin’s third birthday, and since he didn’t have his own friends from Belgium around, Violet’s school pal invited her own friends to come celebrate. It’s funny. Violet’s pal’s mom is Japanese-American. She’s lucky that with twins, her parents live nearby to help out with the incredible amount of work that raising twins along with a preschooler takes. Her husband is of Dutch ancestry. Funnily enough, the mom’s Japanese-American sister married a Dutch-speaking Belgian, so the cousins look very much alike. Adorable American-Dutch-Japanese kids. I was impressed that with everything going on that they could get a birthday party organized. True, it was kind of turn-key; at a toddler to preschool aged play space inside a mall, with a separate party room for cake and pizza, but still, doing anything with that many young kids is hard! I was also impressed with the play space. 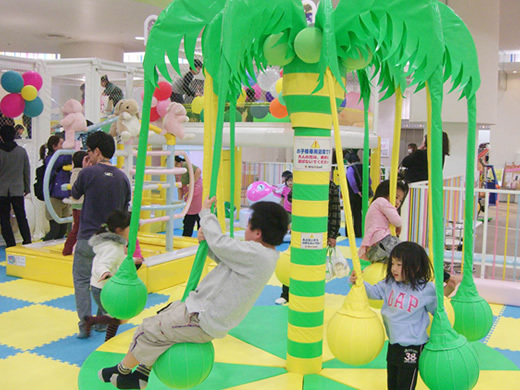 The whole area had very imaginative and fun structures that created an environment that I was surprised to find myself enjoying, despite the inherent chaos of a kids’ play space in a mall. I instantly realized that this Sanrio-like wonderland could only come from Japan. 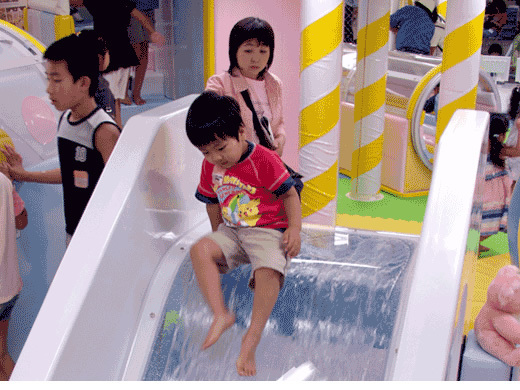 I looked up the manufacturer of “Yu-Kids” playgrounds, which are made in Osaka by a company called “BLD Oriental Co. Ltd.” According to BLD’s website the “B” stands for Bravery, the “L” for Love, and the “D” for Dreams. This struck me as hysterically Japanese. As we walked out of the mall into the night to return home, holding onto our girls and their party hats, we came across a plaque commemorating the site that was now home to the mall. Before a Sears and JcPenney’s and Target went in, it had been a racetrack. Then, after Pearl Harbor, the track was turned into an internment camp. 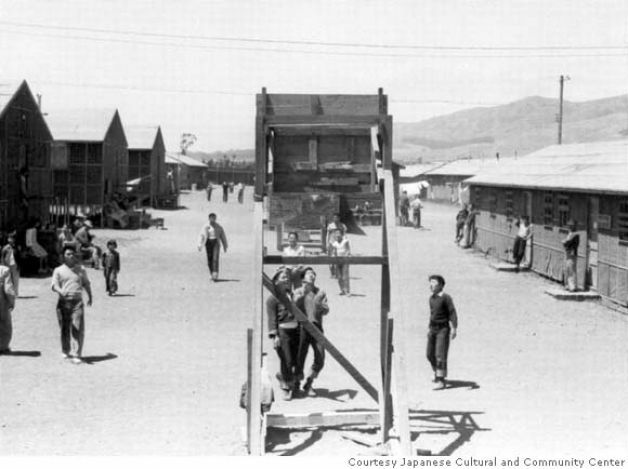 Over 8000 Japanese-Americans had been forcibly made to live in horse stalls and barracks inside the fenced and guarded track. Over sixty-five babies were born at the track during incarceration. And here we had been, singing happy birthday and eating pizza and bouncing happily on the same soil with kids all around who couldn’t have their “Americaness” or “Japaneseness” or “Dutchness” or any other part of their whole separated or parsed. Suddenly, “bravery, love and dreams” doesn’t seem so funny. It seems just about right. 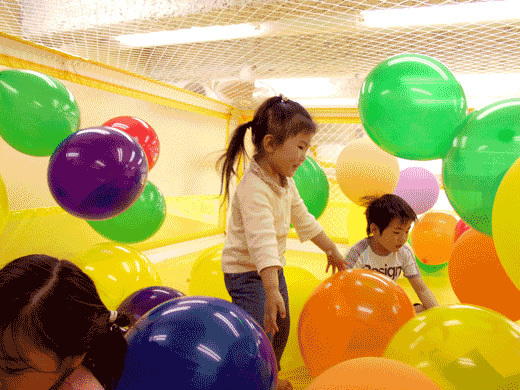 This entry was posted in Uncategorized and tagged BLD Oriental, Hop and Play, Japanese Internment, Tanforan. Bookmark the permalink. I am still so disturbed that I never EVER heard about the Japanese internment from anyone in my family, my schooling while growing up in Wisconsin, or my “history” class at BYU. It was only upon moving to California that I learned. So deeply messed up. But, that party does not look messed up. 🙂 Glad it was a fun time for everyone! I really enjoyed reading this. Wonderfully written. Allison Muir is a San Franciscan writer, artist, and interior designer. During her varied career she has designed D.I.Y. projects for ReadyMade Magazine, coordinated postproduction for clients such as Industrial Light and Magic, Dreamworks and Pixar, and produced and written for Al Gore’s Current TV. She likes restaurants with themes and gimmicks.